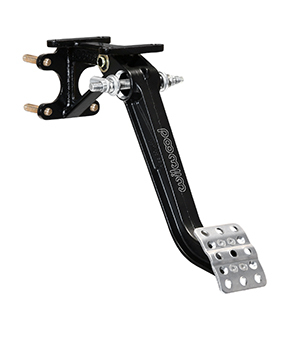 Wilwood's Tru-Bar fixed Trunnion bearing balance bar provides the ultimate in precision control, feel and adjustment accuracy on twin master cylinder brake pedals. Eight new pedals utilizing three different configurations (forward swing, reverse swing and floor mount) covering virtually every racing application. Below is a list of the Tru-Bar pedals. If you need additional information, or would like to place an order contact our technical experts at (805) 388-1188. Tru-Bar Pedals and Mounts – What is a Tru-Bar Balance Bar? The Tru-Bar balance bar system represents the highest degrees of precision and durability in manual bias adjustment and control between two separate master cylinder circuits. Tru-Bar twin cylinder brake pedals and master cylinder mounts utilizes a fixed position trunnion bearing in the pedal arm. The Tru-Bar system eliminates all side play and adjustment slack. In addition to the trunnion bearing, each master cylinder pushrod is attached to the balance bar bolt with mono-ball rod ends. The balance bar and master cylinder rods end operate freely, but without play or slack, in this high response, precision system. Durability and response are further enhanced with a full 7/16”-20 thread and diameter bearing bar. The combination of precision movement and the slightly wider thread as compared to 3/8”-24 threaded balance bars, provides the fastest and most accurate adjustment of any balance bar system available. All brake bias balance bars work best and most efficiently when part of a closely balanced system that allows the balance bar to be generally centered in its lateral adjustment position as a baseline static setting. Any vehicle requiring extreme adjustment on the balance to achieve acceptable deceleration control should be re-evaluated regarding the combination of master cylinder sizes and caliper piston bore volumes being used. Tru-Bar Pedal upgrade replacement parts. Allows upgrade of existing Wilwood pedals to to to the Tru-Bar trunion assembly. 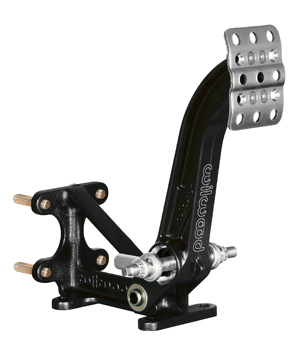 Wilwood’s Tru-Bar balance bar system is now available in a Forward Swing mount pedal. Tru-Bar pedals utilize a fixed trunnion bearing in the pedal arm, with spherical rod-end bearing pushrod attachments. 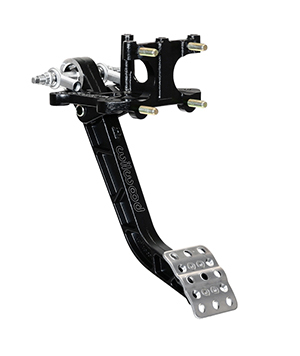 They provide ultimate precision, control, and adjustment of the brake bias on race prepped vehicles. 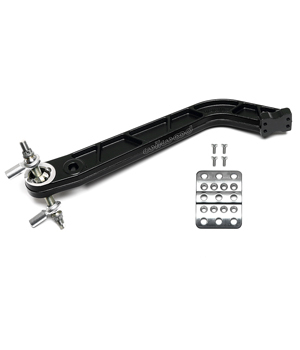 The new Tru-Bar pedals utilize the same chassis and master cylinder mounting as all Wilwood balance bar style pedals. A stronger and larger diameter 7/16-20 bar provides quicker adjustment. 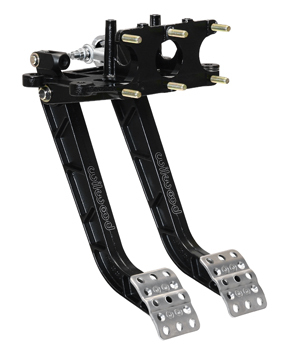 Wilwood’s Tru-Bar balance bar system is now available in a Forward Floor mount pedal. Tru-Bar pedals utilize a fixed trunnion bearing in the pedal arm, with spherical rod-end bearing pushrod attachments. They provide ultimate precision, control, and adjustment of the brake bias on race prepped vehicles. 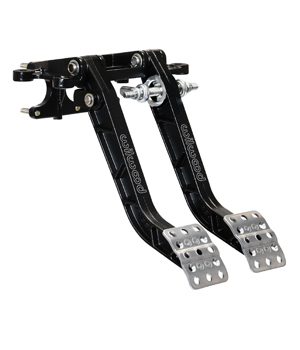 The new Tru-Bar pedals utilize the same chassis and master cylinder mounting as all Wilwood balance bar style pedals. A stronger and larger diameter 7/16-20 bar provides quicker adjustment. 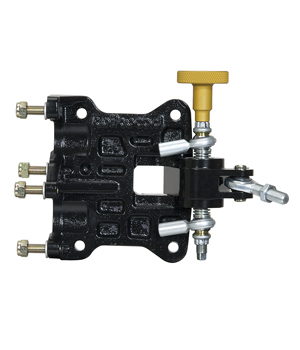 This Tru-bar unit is ideal for Dirt Modifieds, Champ Cars, Sprint Cars, Midgets, or any application where the master cylinders must be mounted in a remote location from the pedal. To accommodate fitment in tight space locations, the master cylinders are mounted at 60 degrees from the pedal base for use with remote fill fluid reservoirs. This unit features a high leverage, machined billet pivot arm that multiplies input force at a ratio of 1.48:1 and when mounted within the driver’s reach.